II. Was The Great Recession a Balance Sheet Recession? made this type of recessions less likely. B. Endogenous Shock is not foreseen by economic models. 1. Politics of oil caused recent recessions. a. 1973 Arab-Israeli war lead to Oil Embargo causing recession. and sectors are in recession. and business investment and slowing the economy"
holds assets must always equal the sum of liabilities plus equity. entity will focus on debt repayment." II Was The Great Recession a Balance Sheet Recession? knowing it was the difficult to cure Migraine Headache. 1990 was a "balance sheet recession." 2. Koo’s wrongheaded views on the Great Depression ..
Top 10 Recent Financial Crises often lead to local recessions which sometimes roll around the world. 10. The Panic of 1907: Fourth so-called ”panic” in 34 years. See Welcome the Hackocracy a look at Bush 2's appointments that made a difference. by the wealth to invest in many asset markets. were eager to use savings to invest in the U.S. 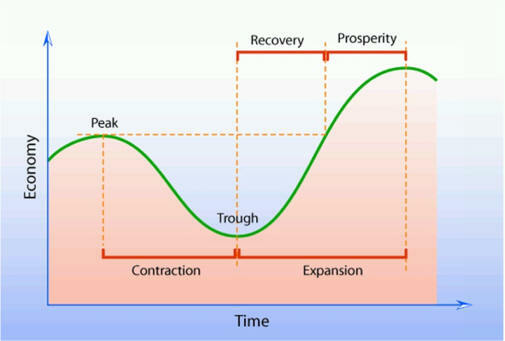 Recession to avoid the Great Recession from turning into Great Depression III. beginning in 1980 and continuing cause serious problems. 1. It enhanced psychology effect. 2. 9/11 got the century off to a terrible start. financial/credits system with extreme optimism then and panic in bad times. to balance client funds with investor's funds. against the desire to grow their burgeoning consultancy practices. Think off balance items allowed and Arthur Anderson scandal. 6. Glass-Steagall Great Depression Act increased systemic financial risk. Imitated and passed by a majority of Republicans it was signed by President Clinton. See Five Bad Bush/Clinton Policies enhanced the Great Recession. 7. 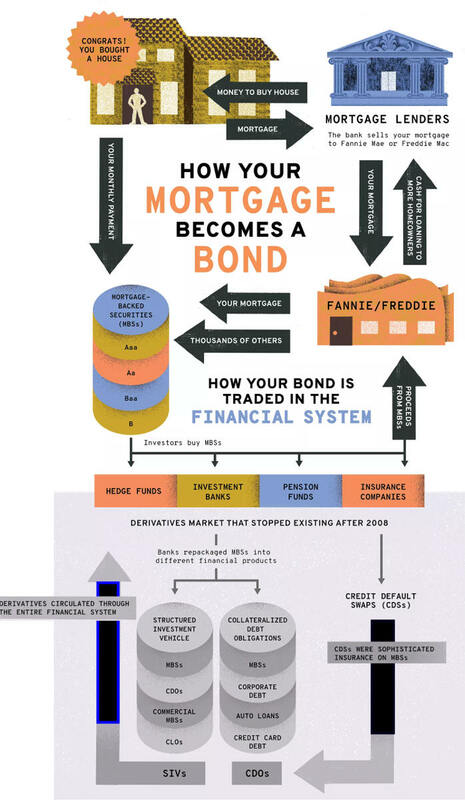 In 2006, FASB required housing assets be mark-to-market by financial institution. Accounting Office (GAO) caused by a recent Savings and Loan Crisis. 1. 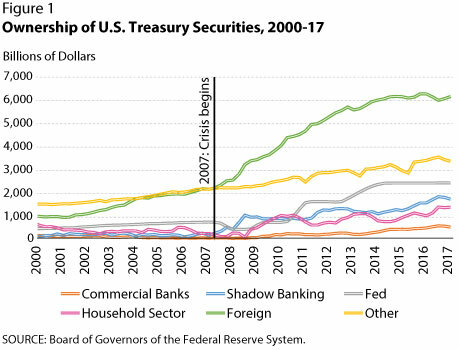 Financial crisis of 2007-9 was tamed by the Federal Reserve. 2. The 2008-9 recession was tamed by monetary and fiscal policy. for all but the very, very, very wealthy. 1. A global savings glut and associated global imbalances. 2. 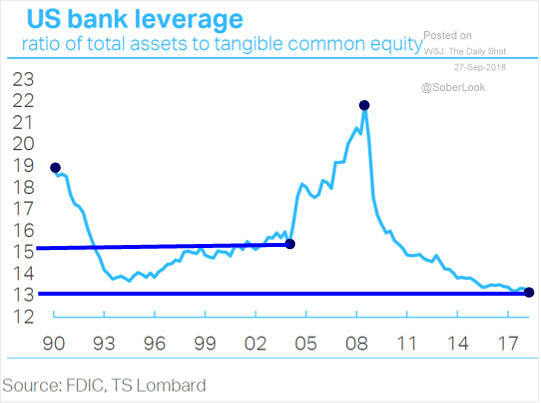 Expansionary monetary policy that ignored asset prices and extensive credit. banking systems and their own currency could and did handle more debt. surpluses. 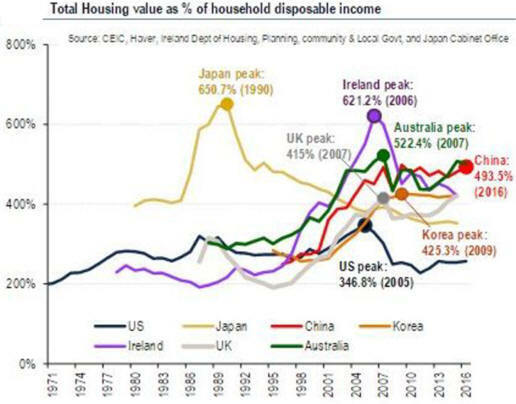 Japan's private sector saved much more after their 1990's credit bubble explosion. 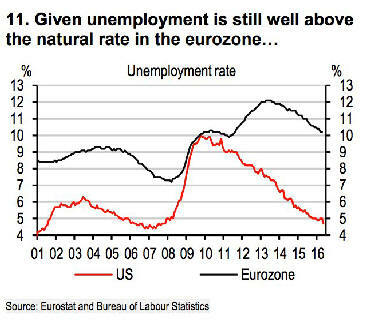 stagnation and negative long term real interest rates. 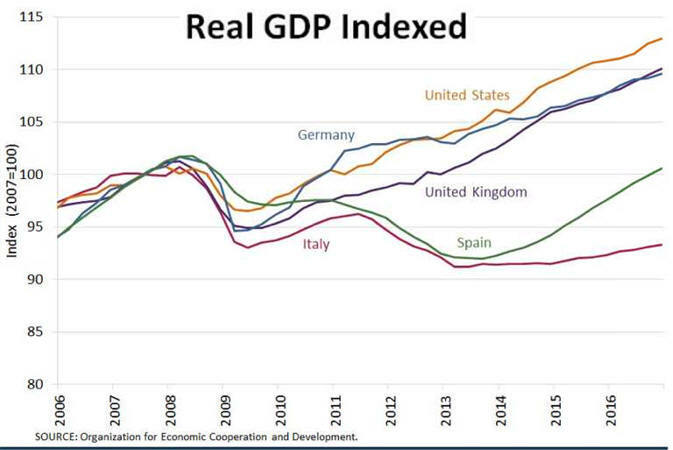 Southern Europe spending socked up the trade surplus and balancing world monetary flows. depression was avoided in all but southern Europe, economic growth slow for too many years. government debt flourished everywhere though less in the US than in Southern Europe. US now has about $10,000/head more than Germany. 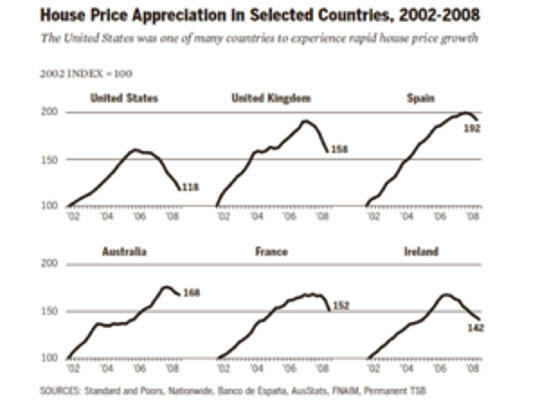 1Cost of Great Recession were much higher. US FED Profit of 100 billion in 2014 were up from 47 in 2009 with and 420 billion 2010-14. 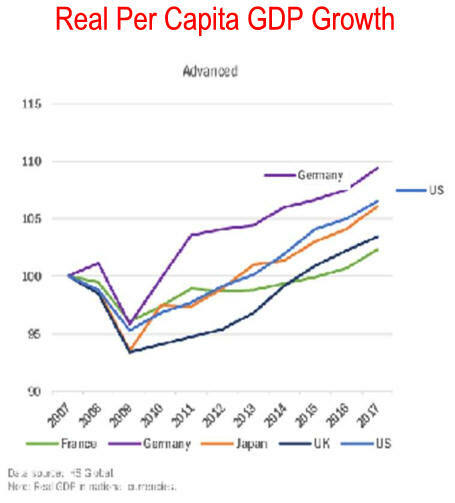 Editor's Note: Using total GDP US leads and Germany plus England are a little behind. Editors Note: As of 10/20/15 much has been done to prevent future financial crisis but these efforts will fail because greed and politics change very slowly. Thankfully for many, Western civilization has progressed to the point where even during poor times well-being is maintained at a reasonable level. See Will Stagnate Median Income Hurt Our Children? b. Perverse incentives encouraged malfeasance. VIII. 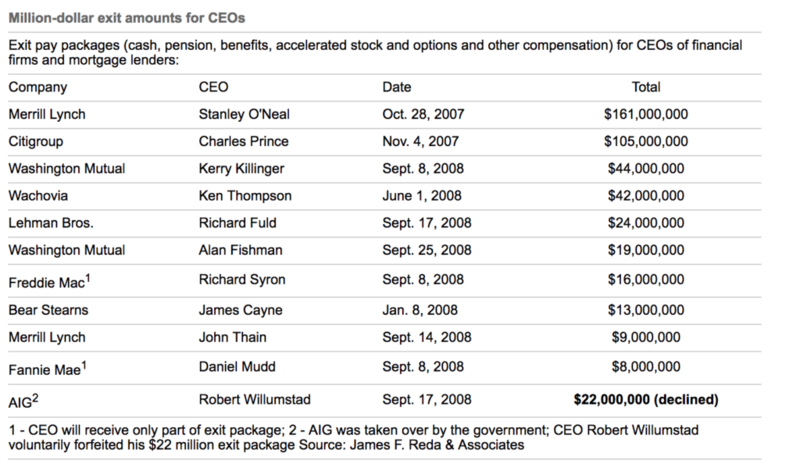 Wiki List of U.S. Recessions Note: I-phone display is poor. Panic of 1785 1785–1788 The panic of 1785, which lasted until 1788, ended the business boom that followed the American Revolution. The causes of the crisis lay in the overexpansion and debts incurred after the victory at Yorktown, a postwar deflation, competition in the manufacturing sector from Britain, and lack of adequate credit and a sound currency. The downturn was exacerbated by the absence of any significant interstate trade. Other factors were the British refusal to conclude a commercial treaty, and actual and pending defaults among debtor groups. The panic among business and propertied groups led to the demand for a stronger federal government. Copper Panic of 1789 17961789–1793 Loss of confidence in copper coins due to debasement and counterfeiting led to commercial freeze up that halted the economy of several northern States and was not alleviated until the introduction of new paper money to restore confidence. Panic of 1797 17961796–1799 Just as a land speculation bubble was bursting, deflation from the Bank of England (which was facing insolvency because of the cost of Great Britain's involvement in the French Revolutionary Wars) crossed to North America and disrupted commercial and real estate markets in the United States and the Caribbean, and caused a major financial panic. Prosperity continued in the south, but economic activity was stagnant in the north for three years. The young United States engaged in the Quasi-War with France. 1802–1804 recession 18021802–1804 A boom of war-time activity led to a decline after the Peace of Amiens ended the war between the United Kingdom and France. Commodity prices fell dramatically. Trade was disrupted by pirates, leading to the First Barbary War. Depression of 1807 18071807–1810 The Embargo Act of 1807 was passed by the United States Congress under President Thomas Jefferson as tensions increased with the United Kingdom. Along with trade restrictions imposed by the British, shipping-related industries were hard hit. The Federalists fought the embargo and allowed smuggling to take place in New England. Trade volumes, commodity prices and securities prices all began to fall. Macon's Bill Number 2 ended the embargoes in May 1810, and a recovery started. 1812 recession 18121812 The United States entered a brief recession at the beginning of 1812. The decline was brief primarily because the United States soon increased production to fight the War of 1812, which began June 18, 1812. 1815–21 depression 18151815–1821 Shortly after the war ended on March 23, 1815, the United States entered a period of financial panic as bank notes rapidly depreciated because of inflation following the war. The 1815 panic was followed by several years of mild depression, and then a major financial crisis – the Panic of 1819, which featured widespread foreclosures, bank failures, unemployment, a collapse in real estate prices, and a slump in agriculture and manufacturing. 1822–1823 recession 18221822–1823 After only a mild recovery following the lengthy 1815–21 depression, commodity prices hit a peak in March 1822 and began to fall. Many businesses failed, unemployment rose and an increase in imports worsened the trade balance. 1825–1826 recession 18251825–1826 The Panic of 1825, a stock crash following a bubble of speculative investments in Latin America led to a decline in business activity in the United States and England. 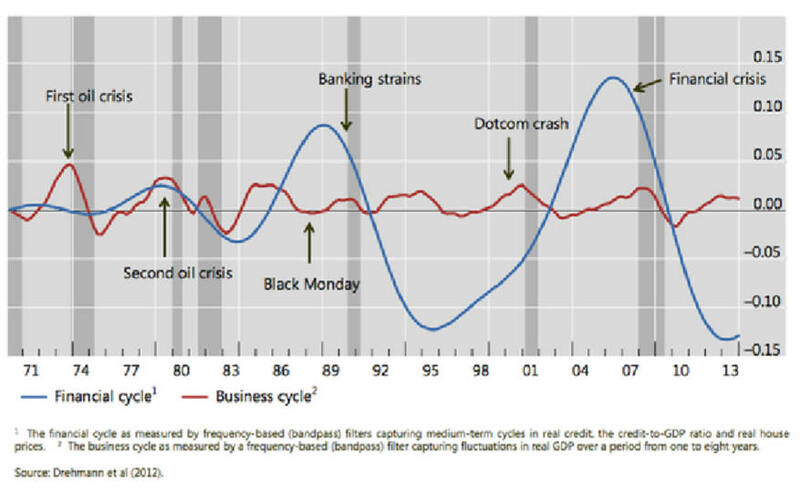 The recession coincided with a major panic, the date of which may be more easily determined than general cycle changes associated with other recessions. 1828–1829 recession 18281828–1829 In 1826, England forbade the United States to trade with English colonies, and in 1827, the United States adopted a counter-prohibition. Trade declined, just as credit became tight for manufacturers in New England. 1833–34 recession 18331833–1834 The United States' economy declined moderately in 1833–34. News accounts of the time confirm the slowdown. The subsequent expansion was driven by land speculation. late 1839–late 1843 recession -34.3% — This was one of the longest and deepest depressions. 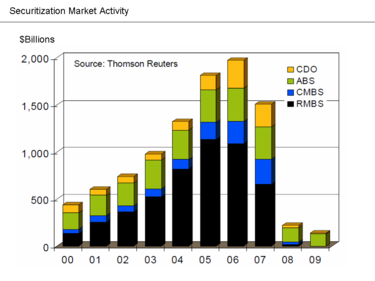 It was a period of pronounced deflation and massive default on debt. The Cleveland Trust Company Index showed the economy spent 68 months below its trend and only 9 months above it. The Index declined 34.3% during this depression. 1845–late 1846 recession −5.9% — This recession was mild enough that it may have only been a slowdown in the growth cycle. One theory holds that this would have been a recession, except the United States began to gear up for the Mexican–American War, which began April 25, 1846. 1847–48 recession −19.7% — The Cleveland Trust Company Index declined 19.7% during 1847 and 1848. It is associated with a financial crisis in Great Britain. 1853–54 recession −18.4% — Interest rates rose in this period, contributing to a decrease in railroad investment. Security prices fell during this period. 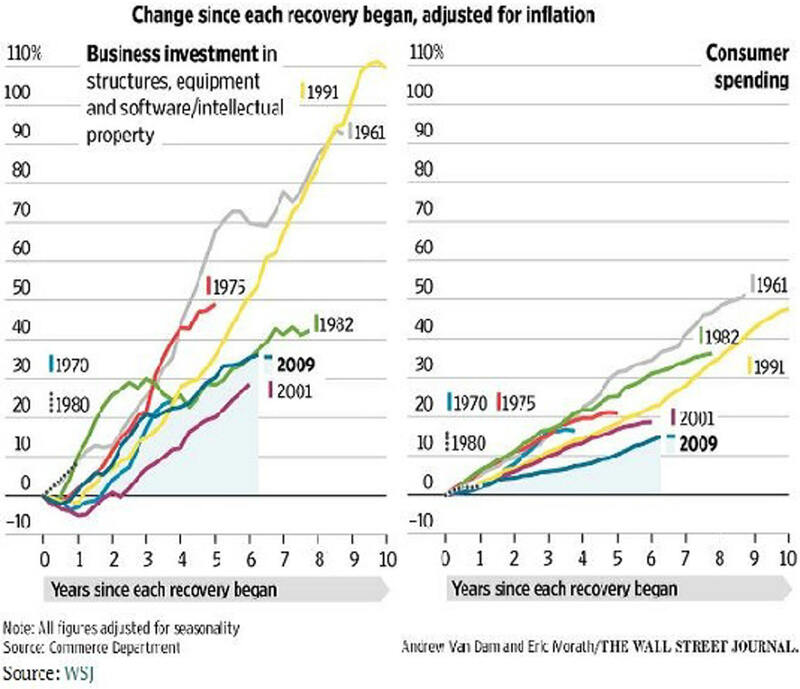 With the exception of falling business investment there is little evidence of contraction in this period. Panic of 1857 −23.1% — Failure of the Ohio Life Insurance and Trust Company burst a European speculative bubble in United States' railroads and caused a loss of confidence in American banks. Over 5,000 businesses failed within the first year of the Panic, and unemployment was accompanied by protest meetings in urban areas. This is the earliest recession to which the NBER assigns specific months (rather than years) for the peak and trough. 1860–61 recession −14.5% — There was a recession before the American Civil War, which began April 12, 1861. Zarnowitz says the data generally show a contraction occurred in this period, but it was quite mild. A financial panic was narrowly averted in 1860 by the first use of clearing house certificates between banks. 1865–67 recession −23.8% — The American Civil War ended in April 1865, and the country entered a lengthy period of general deflation that lasted until 1896. The United States occasionally experienced periods of recession during the Reconstruction era. Production increased in the years following the Civil War, but the country still had financial difficulties. The post-war period coincided with a period of some international financial instability. 1869–70 recession −9.7% — A few years after the Civil War, a short recession occurred. It was unusual since it came amid a period when railroad investment was greatly accelerating, even producing the First Transcontinental Railroad. The railroads built in this period opened up the interior of the country, giving birth to the Farmers' movement. The recession may be explained partly by ongoing financial difficulties following the war, which discouraged businesses from building up inventories. Several months into the recession, there was a major financial panic. Panic of 1873 and the Long Depression −33.6% (−27.3%) [nb 3] — Economic problems in Europe prompted the failure of Jay Cooke & Company, the largest bank in the United States, which burst the post-Civil War speculative bubble. The Coinage Act of 1873 also contributed by immediately depressing the price of silver, which hurt North American mining interests. The deflation and wage cuts of the era led to labor turmoil, such as the Great Railroad Strike of 1877. In 1879, the United States returned to the gold standard with the Specie Payment Resumption Act. This is the longest period of economic contraction recognized by the NBER. The Long Depression is sometimes held to be the entire period from 1873–96. 1882–85 recession −32.8% −24.6% Like the Long Depression that preceded it, the recession of 1882–85 was more of a price depression than a production depression. From 1879 to 1882, there had been a boom in railroad construction which came to an end, resulting in a decline in both railroad construction and in related industries, particularly iron and steel. A major economic event during the recession was the Panic of 1884. 1887–88 recession −14.6% −8.2% Investments in railroads and buildings weakened during this period. This slowdown was so mild that it is not always considered a recession. Contemporary accounts apparently indicate it was considered a slight recession. 1890–91 recession −22.1% −11.7% Although shorter than the recession in 1887–88 and still modest, a slowdown in 1890–91 was somewhat more pronounced than the preceding recession. International monetary disturbances are blamed for this recession, such as the Panic of 1890 in the United Kingdom. Panic of 1893 −37.3% −29.7% Failure of the United States Reading Railroad and withdrawal of European investment led to a stock market and banking collapse. This Panic was also precipitated in part by a run on the gold supply. The Treasury had to issue bonds to purchase enough gold. Profits, investment and income all fell, leading to political instability, the height of the U.S. populist movement and the Free Silver movement. Panic of 1896 −25.2% −20.8% The period of 1893–97 is seen as a generally depressed cycle that had a short spurt of growth in the middle, following the Panic of 1893. Production shrank and deflation reigned. 1899–1900 recession −15.5% −8.8% This was a mild recession in the period of general growth beginning after 1897. Evidence for a recession in this period does not show up in some annual data series. 1902–04 recession −16.2% −17.1% Though not severe, this downturn lasted for nearly two years and saw a distinct decline in the national product. Industrial and commercial production both declined, albeit fairly modestly. The recession came about a year after a 1901 stock crash. Panic of 1907 −29.2% −31.0% A run on Knickerbocker Trust Company deposits on October 22, 1907, set events in motion that would lead to a severe monetary contraction. The fallout from the panic led to Congress creating the Federal Reserve System. Panic of 1910–1911 −14.7% −10.6% This was a mild but lengthy recession. 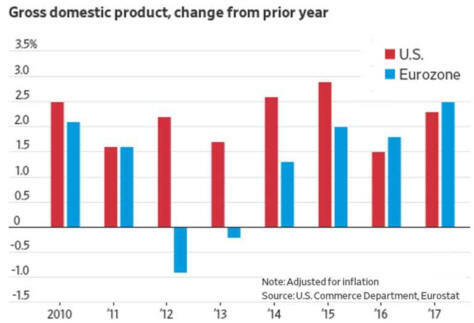 The national product grew by less than 1%, and commercial activity and industrial activity declined. The period was also marked by deflation. Recession of 1913–1914 −25.9% −19.8% Productions and real income declined during this period and were not offset until the start of World War I increased demand. Incidentally, the Federal Reserve Act was signed during this recession, creating the Federal Reserve System, the culmination of a sequence of events following the Panic of 1907. Post-World War I recession −24.5% −14.1% Severe hyperinflation in Europe took place over production in North America. This was a brief but very sharp recession and was caused by the end of wartime production, along with an influx of labor from returning troops. This, in turn, caused high unemployment. Depression of 1920–21 −38.1% −32.7% The 1921 recession began a mere 10 months after the post-World War I recession, as the economy continued working through the shift to a peacetime economy. The recession was short, but extremely painful. The year 1920 was the single most deflationary year in American history; production, however, did not fall as much as might be expected from the deflation. GNP may have declined between 2.5 and 7 percent, even as wholesale prices declined by 36.8%. The economy had a strong recovery following the recession. 1923–24 recession −25.4% −22.7% From the depression of 1920–21 until the Great Depression, an era dubbed the Roaring Twenties, the economy was generally expanding. Industrial production declined in 1923–24, but on the whole this was a mild recession. 1926–27 recession −12.2% −10.0% This was an unusual and mild recession, thought to be caused largely because Henry Ford closed production in his factories for six months to switch from production of the Model T to the Model A. Charles P. Kindleberger says the period from 1925 to the start of the Great Depression is best thought of as a boom, and this minor recession just proof that the boom "was not general, uninterrupted or extensive". (1933) 26.7−26.7% Stock markets crashed worldwide. 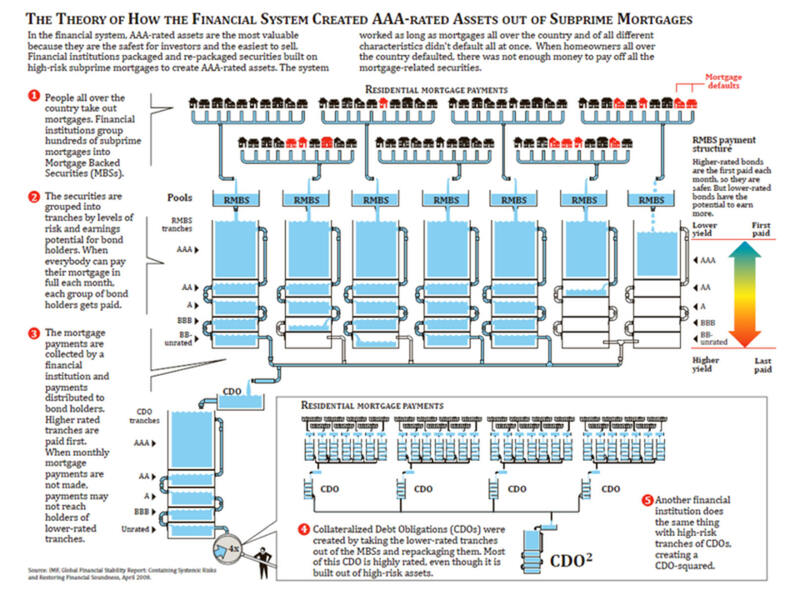 A banking collapse took place in the United States. Extensive new tariffs and other factors contributed to an extremely deep depression. The United States did remain in a depression until World War II. In 1936, unemployment fell to 16.9%, but later returned to 19% in 1938 (near 1933 levels). (1938) 03.4−18.2% The Recession of 1937 is only considered minor when compared to the Great Depression, but is otherwise among the worst recessions of the 20th century. Three explanations are offered for the recession: that tight fiscal policy from an attempt to balance the budget after the expansion of the New Deal caused recession, that tight monetary policy from the Federal Reserve caused the recession, or that declining profits for businesses led to a reduction in investment. (1946) 12.7−12.7% The decline in government spending at the end of World War II led to an enormous drop in gross domestic product, making this technically a recession. This was the result of demobilization and the shift from a wartime to peacetime economy. The post-war years were unusual in a number of ways (unemployment was never high) and this era may be considered a "sui generis end-of-the-war recession". (Oct 1949) 01.7−1.7% The 1948 recession was a brief economic downturn; forecasters of the time expected much worse, perhaps influenced by the poor economy in their recent lifetimes. The recession also followed a period of monetary tightening. (Sep 1954) 02.6−2.6% After a post-Korean War inflationary period, more funds were transferred to national security. In 1951, the Federal Reserve reasserted its independence from the U.S. Treasury and in 1952, the Federal Reserve changed monetary policy to be more restrictive because of fears of further inflation or of a bubble forming. (July 1958) 03.1−3.7% Monetary policy was tightened during the two years preceding 1957, followed by an easing of policy at the end of 1957. The budget balance resulted in a change in budget surplus of 0.8% of GDP in 1957 to a budget deficit of 0.6% of GDP in 1958, and then to 2.6% of GDP in 1959. (May 1961) 01.6−1.6% Another primarily monetary recession occurred after the Federal Reserve began raising interest rates in 1959. The government switched from deficit (or 2.6% in 1959) to surplus (of 0.1% in 1960). When the economy emerged from this short recession, it began the second-longest period of growth in NBER history. The Dow Jones Industrial Average (Dow) finally reached its lowest point on Feb. 20, 1961, about 4 weeks after President Kennedy was inaugurated. (Dec 1970) 00.6−0.6% The relatively mild 1969 recession followed a lengthy expansion. 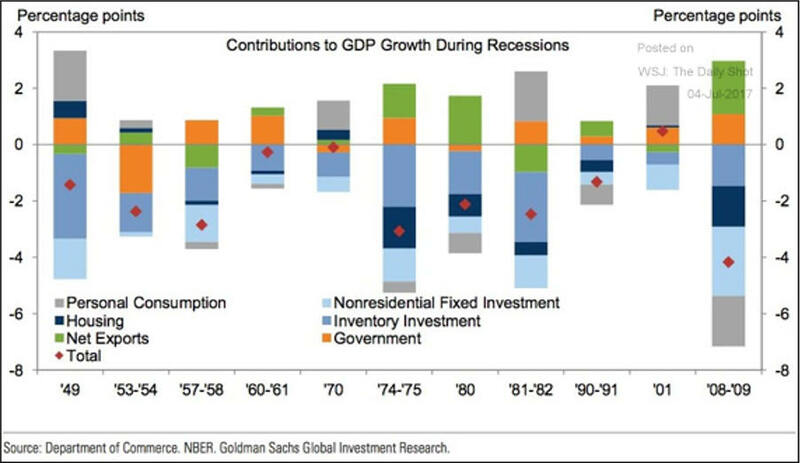 At the end of the expansion, inflation was rising, possibly a result of increased deficits. This relatively mild recession coincided with an attempt to start closing the budget deficits of the Vietnam War (fiscal tightening) and the Federal Reserve raising interest rates (monetary tightening). (May 1975) 03.2−3.2% A quadrupling of oil prices by OPEC coupled with high government spending because of the Vietnam War led to stagflation in the United States. The period was also marked by the 1973 oil crisis and the 1973–1974 stock market crash. 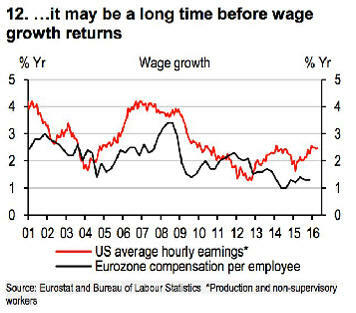 The period is remarkable for rising unemployment coinciding with rising inflation. (July 1980) 02.2−2.2% The NBER considers a very short recession to have occurred in 1980, followed by a short period of growth and then a deep recession. Unemployment remained relatively elevated in between recessions. The recession began as the Federal Reserve, under Paul Volcker, raised interest rates dramatically to fight the inflation of the 1970s. The early '80s are sometimes referred to as a "double-dip" or "W-shaped" recession. (Nov 1982) 02.7−2.7% The Iranian Revolution sharply increased the price of oil around the world in 1979, causing the 1979 energy crisis. This was caused by the new regime in power in Iran, which exported oil at inconsistent intervals and at a lower volume, forcing prices up. Tight monetary policy in the United States to control inflation led to another recession. The changes were made largely because of inflation carried over from the previous decade because of the 1973 oil crisis and the 1979 energy crisis. (June 1992) 01.4−1.4% After the lengthy peacetime expansion of the 1980s, inflation began to increase and the Federal Reserve responded by raising interest rates from 1986 to 1989. 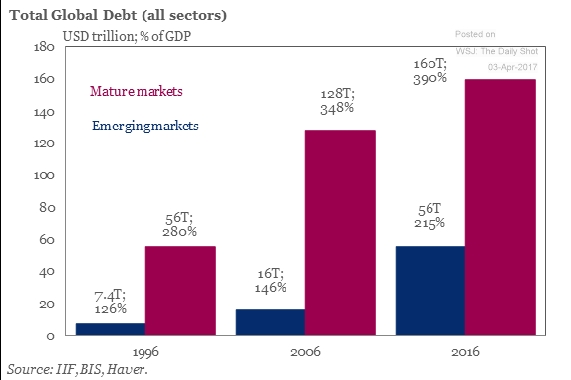 This weakened but did not stop growth, but some combination of the subsequent 1990 oil price shock, the debt accumulation of the 1980s, and growing consumer pessimism combined with the weakened economy to produce a brief recession.